Fleas are irritating intruders which present a cause of discomfort for both our pets and ourselves. They are very resilient parasites, which multiply rapidly in the home, bringing itchiness wherever they go. Eradicating fleas from your home is not a quick process. Sometimes it can take many treatments to completely clear a serious infestation. So, what to do in the meantime? Should you just accept that you are a tasty meal to your uninvited guests until you can destroy every last one of them? You don’t have to settle for being on the menu for fleas. There are many different kinds of flea repellents that can be used to prevent these bloodsuckers from biting you during their unwelcome stay. This article examines the different types of flea repellent and how to use them effectively to keep those infuriating pests at bay. What Can You Use as Flea Repellent on Your Skin? Can Flea Repellents Be Used on Clothing Too? Fleas are tiny blood-sucking insects which vary from light reddish brown to black in color. They have specially designed mouthparts which enable them to pierce through skin and drink the blood beneath. They reach a host by leaping long distances with a pair of very powerful hind legs. While humans can certainly 'catch' fleas, we don't have to worry too much about becoming their new hosts. Fleas like to attach themselves to an animal host and remain there for the duration of their adult lives. But they can also transfer to humans for a feed if they get the opportunity. Most often, this occurs either because there is no animal host available, or they have become dislodged from their host and take the chance at a meal when we are nearby. The bites from fleas become very itchy and inflamed due to a chemical contained in their saliva. This chemical serves as a “pre-digestant,” softening the skin to help them bite through. It also becomes mixed in with our blood to prevent it from clotting, so the flea can feed for as long as it wishes. The itchiness of flea bites naturally leads to scratching, which can bring its own risks. If the skin becomes broken, this presents a real danger of infection which can be serious. Therefore, repelling fleas from biting in the first place can prevent much irritation and pain. Chemical and natural flea repellents are believed to work by creating an extremely unpleasant environment for fleas. Most of us will have experienced a strong-smelling liquid close to our faces that has the potential to irritate our eyes and nose. The same is true for fleas; usually, these repellents have a strong odor and taste which fleas simply cannot stand. Once the repellent has been applied, the smell is much stronger to the fleas than the person using it. The fleas will quickly leave the area and stay away as long as the repellent is active. There are two categories when it comes to flea repellents: natural and chemical. Both are effective, so it’s a matter of personal choice which one you use. 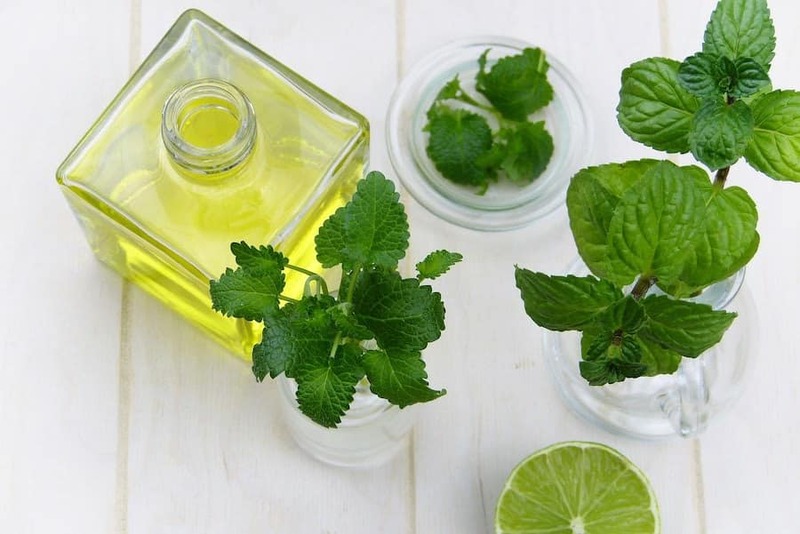 Some people may prefer to use a natural treatment for fear of applying chemicals to their skin, but it’s important to note that some homemade repellents must still be used with care as they too can irritate the skin. Chemical repellents almost always use N,N-Diethyl-meta-Toluamide or DEET. DEET is a form of “broad spectrum” repellent which is capable of repelling many kinds of insects. It has been in use since 1946 when it was developed by the US Army to protect their soldiers in the jungle from contracting diseases carried by mosquitoes. 11 years later, it was recognized as safe for the general public to use. Almost all commercial insect repellents will contain DEET in some concentration. It’s available in many different strengths and formats, from wipes and sprays, to creams, roll-ons, and sticks. It can be applied directly to the skin and clothing and effectively repels insects for many hours. For those who prefer to avoid chemicals, some natural options include neem, citronella oil, lemon, peppermint, rosemary, eucalyptus and apple cider vinegar. These will almost certainly need to be diluted before topical use, the degree to which depends upon the type of oil being used. A good option is to make your own natural flea repellent at home. You can select three of the above oils which you like for this purpose. They should not be applied directly to the skin, to avoid irritation. But they can be diluted with distilled water, or an aromatherapy carrier oil such as grapeseed, almond oil, jojoba oil, or sweet almond oil. For a day-to-day flea repellent, you should use a 10 percent concentration of essential oils in the solution. So, you will have 90 percent water or carrier oil, and 10 percent mix of the oils you prefer. Once you have combined the ingredients in a spray bottle, simply shake up the bottle well before each application. Alternatively, you can purchase insect repellent sprays which use a pre-diluted combination of these ingredients. DEET products will provide immediate protection against all biting insects for many hours after use. Once you have applied it to exposed skin, the protection will extend out around 1.5 inches from the application location. For example, applying DEET to the lower legs will not provide protection the feet, they will need to be covered too. The strength of DEET concentrations in commercial products can vary by large amounts. Strengths between 4 and 100 percent DEET are available, depending on your needs. The stronger concentrations simply provide protection for longer; they do not provide a higher level of protection. The lower concentrations of DEET will generally give protection against bites for about 3-6 hours per application. Higher concentrations usually give around 12 hours of protection. The problem with higher concentrations of DEET is that they become more viscous and sticky, and the percentage of DEET increases. This results in a “tacky” and oily feeling to the skin, which persists without fully drying or absorbing. Natural flea repellents are applied in the same manner as DEET repellents, but they often need to be reapplied more frequently. Repellents containing essential oils generally provide protection for around 4 hours before needing to be reapplied. If you are sweating, they may need to be reapplied sooner. You must keep in mind that only certain essential oils are deemed effective against fleas. Some, like tea tree oil, have been determined as not very effective at repelling them. Contrary to what you may have heard, fleas generally cannot bite through your clothing. Socks, jeans, and t-shirts are thick enough to prevent them from reaching the skin. The only exceptions are very thin and close fitting clothes, like pantyhose, thin leggings or yoga pants. Fleas can be quite determined creatures, though. If they cannot get straight through to your skin to feed, they will attempt to get underneath your clothing and bite. They generally like to feed in places where they are hidden, as this is what they are used to when feeding among a host’s fur. Fleas will also sometimes tuck themselves into the creases and seams of clothes to hide in between feeding. In this manner, clothing can actually be useful to fleas. The fibers of our clothing are much easier for fleas to hang onto than our sparsely haired skin; and fleas don't particularly like human head hair. Most commercially purchased repellents which contain DEET are designed to be used over clothing as well as directly onto the skin. But it is always wise to check the directions before liberally spraying all over your favorite pair of pants. Some products will advise against use on certain fabrics, depending on the ingredients and the concentration of DEET which is used. The use of adequately diluted essential oils sprayed onto clothing is safe and shouldn’t damage the fabric. However, using neat oils on clothing isn’t advised. Some oils can leave a stain or affect the color of the fabric. If you want to use neat oils, it’s best to do so on the skin beneath your clothing. Studies into the effects of DEET on human health have concluded that it is safe for use on the skin. There have been many reviews regarding the use of DEET over the years, with all of them finding that the use of DEET as directed is generally safe. There have been some horror stories in the media in the past regarding damage to the nervous system, but there is no evidence currently to support this. It is possible to experience a negative skin reaction to DEET in insect repellents, but this is incredibly rare. If DEET comes into contact with the eyes, it will cause pain, irritation, and tears. It should be rinsed thoroughly with water should this occur. If you experience blurred vision which persists, contact a doctor. If DEET is left on the skin for much longer than necessary, this can result in irritation, redness, rash and sometimes swelling. If it is ingested, vomiting, stomach pains and nausea can occur. If DEET is ingested, even if you feel well, you should immediately seek medical assistance. In extremely rare cases, people have suffered seizures after exposure to DEET. This is almost always the result of ignoring usage directions, or actually drinking DEET. Essential oils are safe to be used topically but should be diluted to avoid skin irritation. They should also never be ingested and medical advice should be sought before use if you’re pregnant. If essential oils get into the eyes, rinse well with water. Both essential oils and DEET products should be kept well away from pets and children, unless designed for use on them. Finding fleas or flea bites on a pet is bad enough, but when these parasites start to feed on us too, it can become a nightmare. Flea bites cause intense irritation, as well as being embarrassing. Of course, tackling the source of fleas directly is the only way to be completely rid of them. But in the meantime, the use of a flea repellent is the best way to avoid discomfort and unsightly bites. As we have seen, you have many choices regarding the strength and type of repellent you decide upon. Chemical repellents can be very effective for long periods, but if you prefer natural remedies, essential oils will also work well in protecting you against fleas.